This scenario is terrible. It forces you to make decisions that are not going to work for any character in this game. If you play this, please put aside your thoughts about how Pathfinders ought to properly act. My entire table is literally angry about the way this scenario forced us into decisions. I'll avoid putting the details in, even under a spoiler, but I've rarely seen a scenario leave a table so angry. Read more than just the scenario first. Because despite the bones of this scenario being a fairly simple railroad (PCs talk to NPC, go collect objects 1, 2, 3; have social encounter), the adventure takes place on another plane with fantastical creatures and requires the author to devote some time flushing those out. As a result, a lot of the "in between stuff" is left undefined. Unlike another scenario which might tell you the names of 6 merchants the players can speak to for information, this scenario does no such thing. It just says "they can make this check and it takes this long to learn X." Well that doesn't mean that the players don't encounter 6 merchants, it just means that you get to define them. And that is freedom. Especially given the backdrop of Axis. Axis got a recent write up in War for the Crown, as did psychopomp culture, both of which are at play in this scenario. When you go to GM this scenario, do yourself a favor and read up on those things, as well as Hao Jin herself. If you don't have access to the books, check out the Pathfinder wiki -- its not as detailed but contains the same major points. Having a strong understanding of Axis, Pharasma (river of souls), and Hao Jin, goes a long way to making this adventure stand out. I mentioned the simplistic structure earlier, and I want to be clear that it isn't a detriment in this scenario. Yes, in almost any other adventure, the structure would be a knock against it in my book. However, given the complexity of the setting, the motivations, and the story behind the scenario, having a simple layout for the adventure is a welcome blessing. Otherwise this scenario would almost be too much. Also, the simpler the layout the more prep time you have to read up on all that juicy lore. And man, is it good. The story the author presents here is solid. Hao Jin's motivation, the various places her memory USB drives have gone, what results those have had, the tie in with 322. But the real moment it shines is in the judges. Each judge that presides over her trial has a specific problem with what she did--make the tapestry. Judge A is an immortal being that watches over civilizations and preserves history so it can be passed down to younger generations. Hao Jin literally abducted thousands of people from their culture and trapped them in a demi plane. Whoops. Judge B is the herald of exactness, more or less, who is upset with how Hao Jin made her demi plane. She broke lots of laws on Axis, and Judge B knows them all. Things aren't looking great. Judge C is a psychopomp, tasked with preserving the passage of souls to Pharasma so they may be judged and pass on the the afterlife. Any mucking about with that process is a big cosmic no-no. Hao Jin may have syphoned off residual soul stuff to make her demiplane function. So basically, she's screwed on three fronts. But over the course of the game, the PCs can learn of Hao Jin's motivations, her process, and the details of how she did what she did and actually formulate solid counter arguments for each judge. And if they do so, they can help sway them to find her innocent of her crimes. That's freaking cool. Name another scenario where you decide the fate of an immortal mythic tiered sorcerer before a tribunal of eternal beings on another plane. Go ahead, I'll wait. This scenario goes big and doesn't disappoint. Do your players a favor and run this game for them, but make sure you read up on your lore ahead of time. I think this adventure could going very very differently if you change up the GM, the players at the table, or even the character you bring. 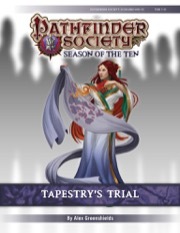 I had the good fortune to play at the same table as one of the local venture agents, who was enthusiastic about role-playing, and knew a bunch of the backstory details about Hao Jin and the tapestry. He made the end of the scenario a lot of fun, and worked hard to involve the rest of the table, even those players who were not as talkative or role-play enthusiastic. He, more than the scenario author, or the GM, made my experience playing this adventure 5 stars. On the flip side, I played a barbarian and I did not make a single attack role (partly due to a bad tactical decision on my part with a held action). I enjoyed the game despite this, but if you are the sort of player who wants a minimum quota of hitting things then you might think this is a 2 or 3 star mod. As the previous reviewer said, don't try to run this cold as the GM. Find a group of players who are willing to do a reasonable amount of role-play, and know a bit of the back story about the tapestry. If you bring a character who has some social or knowledge skills, you'll get to roll more dice. If you bring a character who has played at least some of the tapestry related mods, then you'll have more reason to get involved in the role-play. This adventure has the potential to be really cool, but I imagine that it might also be kind of miserable with the wrong sort of table. This scenario should not be run cold or by a first time GM the scenario demands a lot of prep and knowledge about the events of the Hao Jin tapestry. The fight is appropriate and up to tier however like most it cuts the GM by the knees. While there is a great amount of role playing here I feel its too heavily slanted to one side but not enough that it feels ham fisted. Now on to the good this scenario has some of the best interactions I've had as a GM it allows great moral questioning and a ton of role play options. It forces players to think and develop their characters in a way they might not of before. The systems and layouts are all well explained and interesting. No check feels out of place here nor do any of them feel pointless or too easy. All in all a wonderful scenario that deserves a 5. Gotta collect all them outer planes! So stoked that this is culminating in meeting the Ruby Phoenix herself! I suspect that we won't actually meet her in this. I suspect that dealing with her will either be a 12-15 or the 1st edition culmination multi-table. This scenario makes use of the following maps. In addition, I recommend having a blank Flip-Mat handy, as there's a possible encounter that takes place in an open area. The table of contents calls it Tapestry's Toil. Folks, there is a slight typo on p. 6. It states that it's a Hard Perception check to "get the feeling of being watched", but the scenario doesn't list what a Hard check for the subtiers might be. A Hard Perception check at subtier 7-8 is 28, and at subtier 10-11, it's a 33.